Spam has always disgusted me a little. I have mental reservations about certain food items, knowing (or rather, not knowing) what exactly I'm eating each time: sausages, hotdogs, and the like. I'm still getting over my 9th grade education about the horrors of America's meatpacking industry, when Upton Sinclair's The Jungle was first introduced to me. Clearly, I have opened back up to eating wieners and the all-American hotdogs, given my entry about happily pigging out on Papaya Dog's hotdogs, but Spam is a whole other level. 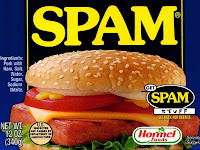 My Cantonese and Korean counterparts have always recoiled in horror whenever I mention my disgust with Spam. So, in their honor and with an open mind, I picked up the can of Spam sitting in our cabinet and proceeded to make my brother some fried rice. Upon opening the can and seeing the block of pink gelatin meat substance, I wanted to give up my mission. I didn't even know how to get the thing out in one nice piece. Complete with soggy rubber sounds as I pulled the Spam out, I ended up forking chunks at a time onto the pan and breaking it up into pieces of mush (gross!). My roommate had left over frozen veggies, so I threw that in along with the other usual fried rice makings, onion, garlic, egg, etc. And at the end, it wasn't so bad. I ate through it pretty satisfied. It was a bit easier to digest since the Spam was in tiny little bits and hardly noticable, so I think taking a bite into a giant Spam-burger still won't be on my list of things to do just yet. Were those my old frozen vegetables that I inherited from Hughie?